Launching from stealth today with a fresh $13.5 million investment led by Andreessen Horowitz is Astranis — the developer of a novel satellite technology that aims to transmit data down to specific terrestrial locations with each satellite it launches. That’s a significant shift from the way companies like SpaceX and OneWeb are building their satellite networks. Both of those companies are launching satellites into low earth orbit — which means that their satellites orbit the earth every ninety minutes. For those companies to provide the kind of uninterrupted connectivity that consumers demand, they’d need to have a network of hundreds — if not thousands — of satellites in place to have a fully operational network. Astranis is planning to launch its satellites into geostationary orbit — farther from the earth and in a location that will remain fixed… which means its satellites can provide connectivity almost immediately after launch. That differentiation was enough to compel Andreessen to make its first investment in the space space and bring on additional capital from previous investors including Y Combinator, 50 Years, and Refactor Capital . 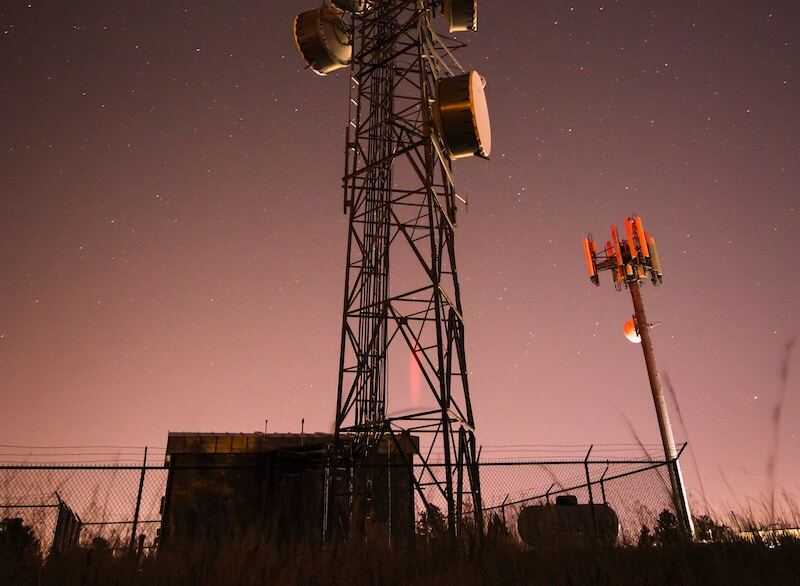 While the long term goal may be to address the problem of the digital divide, as Astranis co-founder and chief executive John Gedmark writes in his blog post, in the near term, don’t expect to see Astranis satellites powering connectivity in emerging markets. “It’s not about connecting immediately the next 3 billion people but the next large swath of people that need a connectivity solution for more sparsely populated areas,” says Martin Casado, a partner with Andreessen Horowitz and director on the Astranis board. Casado says that customer adoption will come because regional providers that hold licenses for spectrum need to use the spectrum they own or risk losing it. Satellite communications become the only way for these license holders to provide services in areas that are too expensive to be connected in any other way. 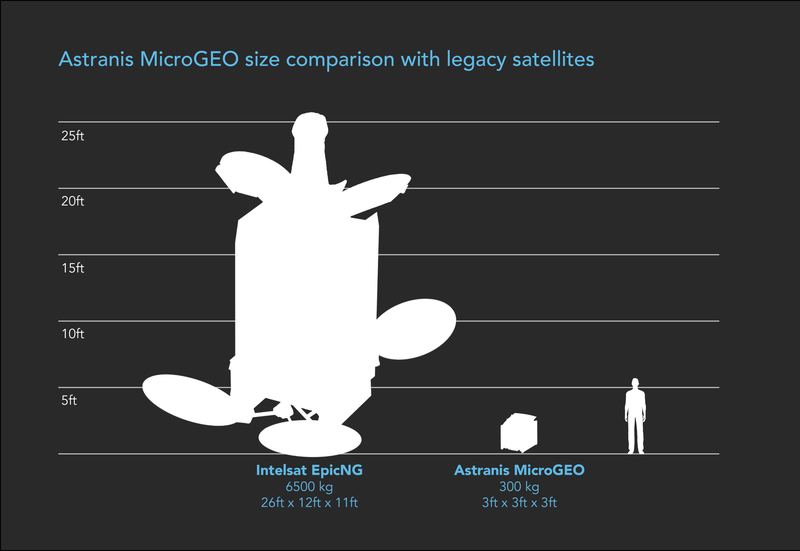 Astranis tackles the immediate connectivity conundrum with its geostationary positioning, and the cost and bandwidth problem with a new model of smaller-sized satellites (roughly the size of a refrigerator) and new software-defined radio technology, according to Gedmark. Unlike previous generations of satellites which could be massive machines that transmitted analog signals, the software defined radio technology enables higher throughput and frequency flexibility to make transmission easier and cheaper, Gedmark says. 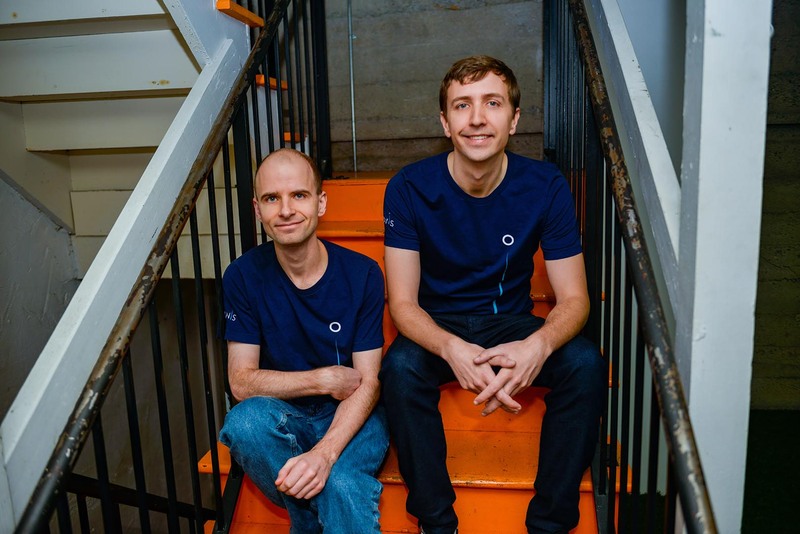 There’s no doubt that Gedmark and his co-founder Ryan McLinko have the pedigree to compete with the aerospace giants pursuing satellite connectivity. Before founding Astranis, Gedmark served as the executive director of the Commercial Spaceflight Federation — the industry association for companies including SpaceX, Blue Origin, and Virgin Galactic — and worked as the director of rocket flights for the XPrize foundation’s launches. Meanwhile, McLinko led mechanical and electrical spacecraft research and development for Planet. Even if the company is able to take a small percentage of the market from SpaceX and OneWeb with that kind of pricing, it would be a huge success given that the satellite telecommunications market is now worth roughly $120 billion, Gedmark estimates. And that’s without including the 4 billion people how currently can’t access the internet. This post will be updated weekly through Q2 2018 with the latest updates on Net Neutrality state laws and legal initiatives. As a result of the FCC’s Restore Internet Freedom Order, elected officials have begun taking up the issue of net neutrality at the state level, with the goal of passing a variety of local-level Net Neutrality state laws. So far, officials across 26 states have taken action aimed at preventing ISPs from engaging in throttling or blocking content or services, engaging in paid prioritization of traffic, or otherwise mismanaging data traffic traveling over broadband networks within state lines. In both federal and state bodies of government, the net neutrality debate falls along party lines, with Democrats in favor of rules enforcing net neutrality, and Republicans favoring a hands-off approach to the issue. US states are using three strategies to preserve elements of Obama-era Net Neutrality laws: Suing the FCC, enhancing requirements for ISPs to get government grants, and creating their own ground-up legislation. Following the FCC’s vote, 22 Attorneys General, led by New York’s Attorney General Eric Schneiderman, have filed a suit against the FCC, asking the court to find the Restore Internet Freedom Order as “arbitrary, capricious, and an abuse of discretion.” The suit follows an investigation into allegations of fake comments in support of the repeal appearing on the FCC’s public comment Website. The investigation was carried out by the New York’s AG office. States suing the FCC as of February 23, 2018: California, Connecticut, Delaware, Hawaii, Illinois, Iowa, Kentucky, Maine Maryland, Massachusetts, Minnesota, Mississippi, New Mexico, North Carolina, New York, Oregon, Pennsylvania, Rhode Island, Vermont, Virginia, Washington and District of Columbia. Legislators in 12 states have introduced legislation which would require ISPs to adhere to a set of net neutrality rules in order to be eligible for state and local government and agency contracts. States pursuing enhanced grant requirements as of February 23, 2018: California, Illinois, Kansas, Maryland, Minnesota, Montana, New York, Oregon, Pennsylvania, Rhode Island, South Dakota, Wisconsin. In 20 states, officials have introduced legislation that would create a set of net neutrality principles that ISPs offering broadband service to residents and business within the state must follow. Here, state approaches vary: some bills outline the creation of a certification process for ensuring ISPs are maintaining net neutrality, others hand over enforcement authority to different state bodies, and some identify violation fines. States pursuing this strategy as of February 23, 2018 include: Alaska, California, Connecticut, Georgia, Hawaii, Idaho, Massachusetts, Nebraska, New Jersey, New Mexico, New York, Pennsylvania, Rhode Island, South Carolina, Tennessee, Vermont, Virginia, Washington, West Virginia and Wisconsin. Alaska state Rep. Scott Kawasaki (D) introduced House Bill 277, with six Democrat cosponsors, which establishes Net Neutrality state laws for any ISP operating within the state. Under Alaska state law, ISPs are already considered utilities. The bill is currently in committee. Two state Senators are tackling the issue with two different pieces of legislation in California. Senate President Pro Tem Kevin De León (D) introduced Senate Bill 460, the California Internet Consumer Protection and Net Neutrality Act of 2018, which would create a set of net neutrality rules that ISPs operating within the state must follow, and which bars state agencies from entering into contract with any ISP unless the ISP certifies, under penalty of perjury, to adhere to net neutrality rules. Fellow state Sen. Scott Wiener (D), along with 13 other Democrats, introduce Senate Bill 822, that would enable the state’s Public Utilities Commission (CPUC) to establish new regulations on how ISPs treat Internet traffic. Both bills are still in committee. No legislation has been introduced at the state level, though two Democrat representatives, Rep. Leslie Herod and Rep. Chris Hansen, have told local media they’re working on a solution. These two legislators have also called for Colorado’s state Attorney General, Cynthia Coffman (R) to join the multi-state suit against the FCC. Connecticut state Sen. Bob Duff (D) introduced a placeholder Senate Bill 2 that would hold ISPs accountable to net neutrality pledges by creating a certification process to ensure ISPs do not engage in blocking, throttling or prioritizing Internet traffic within the state. The bill would also give the state’s Public Utilities Regulatory Authority the ability to enforce net neutrality within the state with civil penalties. The bill is currently still in committee. Connecticut’s Attorney General George Jepsen (D) announced in January that the state will be joining others in suing the FCC. Delaware state Sen. Delcollo (R) introduced Senate Concurrent Resolution 44 establishing the General Assembly’s opposition to the FCC’s repeal of net neutrality rules. The resolution also urges Congressional members to “enact legislation reinstating and requiring the preservation of net neutrality.” The resolution, which had four Republican and nine Democrat cosponsors was passed January 25 with bipartisan support. 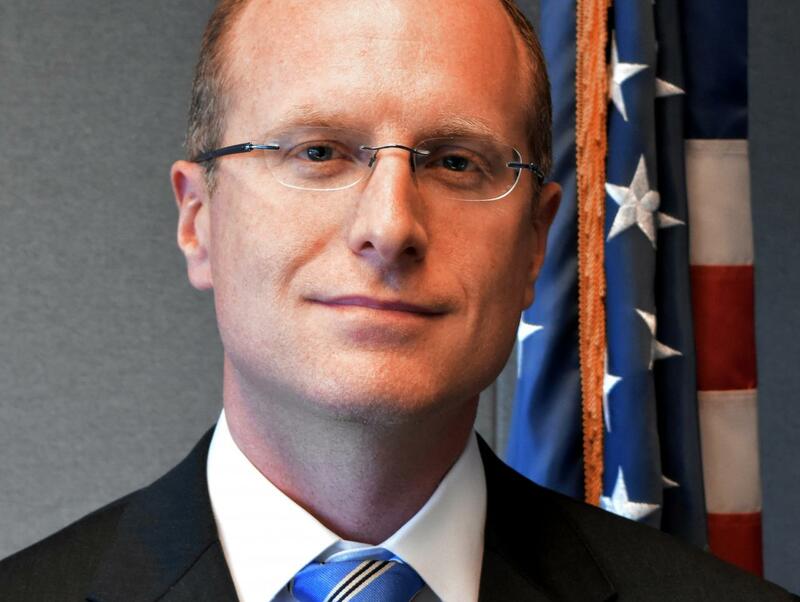 Delaware Attorney General Matt Denn (D) announced in January that the state would join others in suing the FCC. Georgia state Sen. Harold Jones (D) introduced Senate Bill 310, with six Democrat cosponsors, aimed at preserving the open Internet by barring ISPs from blocking or throttling content, applications or services in broadband service offered in the state. The bill is currently in committee. Both the state House and Senate are now considering their own versions of Net Neutrality state laws or legislation aimed at forcing ISPs to comply with net neutrality principles. State Sen. Stanley Chang (D) and six other Democrats introduced Senate Bill 2088, which would require ISPs operating within the state follow net neutrality principles. After a public hearing, the bill has been deferred. In the state’s House, Rep. Kaniela Ing (D) and seven Democrat cosponsors introduced House Bill 1995, which would establish a set of net neutrality principles that ISPs operating within the state must follow, and seeks to establish a task force to “explore the possibility of establishing a state-owned public utility company to provide broadband internet service.” The bill is currently in committee. Idaho state Rep. Paulette Jordan (D) has proposed House Bill 425, a bill that prohibits ISPs operating within Idaho from “blocking lawful content, applications, services or nonharmful devices, subject to reasonable network management,” as well as prohibits them from “impeding or degrading” lawful traffic, and can not engage in paid prioritization.” The bill is currently in committee. Illinois state Rep. Ann Williams (D) and four Democrat cosponsors filed House Bill 4819, entitled the “Broadband Procurement and Disclosure Act,” which bars state contracts from being awarded to ISPs “unless the contract provides specified terms concerning access to and impairment of Internet services.” The bill is currently in committee. No legislation has been introduced at the state level, but local media has reported that lawmakers are currently drafting a net neutrality bill. Iowa’s Attorney General Tom Miller joined the multi-state lawsuit against the FCC. State Rep. Brett Parker (D) introduced House Bill 2682, which proposes requiring ISP entering into contracts with the state to honor net neutrality rules. This bill would also require ISPs to disclose to its customers its network management practices, “for consumers to make informed choices regarding the use of such services.” The bill’s cosponsors include four Democrats and one Republican. The bill is currently in committee. Attorney General Andy Beshear has joined the multi-state suit against the FCC. No legislators have introduced any bills to the state body. Local media has reported that Louisiana Governor John Bel Edwards (D) is mulling an executive order to address the issue. Maine Attorney General Janet Mills (D) has joined the FCC lawsuit. In January, Maryland state Sen.Roger Manno (D) and five other Democrats introduced Senate Bill 287, which would restrict state funds that can be used in contracts with ISPs who do not adhere to net neutrality principles such as blocking lawful content, throttling speeds or engage in “commercial traffic preferencing.” Maryland Attorney General Frosh (D) has joined the multi-state suit against the FCC. Massachusetts state Sen. Barbara L’Italien (D) and state Rep. Andy Vargas (D) introduced two versions of a bill entitled “Act Protecting Consumers by Prohibiting Blocking, Throttling, or Paid Prioritization in the Provision Of Internet Service,” in December 2017, just days after the FCC’s vote. L’Italien introduced Senate Bill 2428 to the state Senate, while Rep. Vargas introduced House Bill 4151 to the State House of Representatives. Both bills aim to devise a set of net neutrality rules for ISPs operating within the state, and give authority of enforcement to the state’s Attorney General, under the Massachusetts Antitrust Act. State Senators have convened a special committee aimed at developing legislation to protect net neutrality rules in response to the FCC’s repeal. The bipartisan Special Committee on Net Neutrality and Consumer Protection, led by Rep. Cynthia Creem (D), Senate Minority Leader Bruce Tarr (R) includes four other Democrats and one Republican. According to local media reports, state Sen. Jamie Eldridge (D) plans to introduce a similar bill that would require all ISPs operating in Massachusetts follow net neutrality rules. Governor Charlie Baker is also reportedly considering releasing an executive order on the issue. Massachusetts Attorney General Maura Healey (D) has joined the multi-state suit against the FCC. 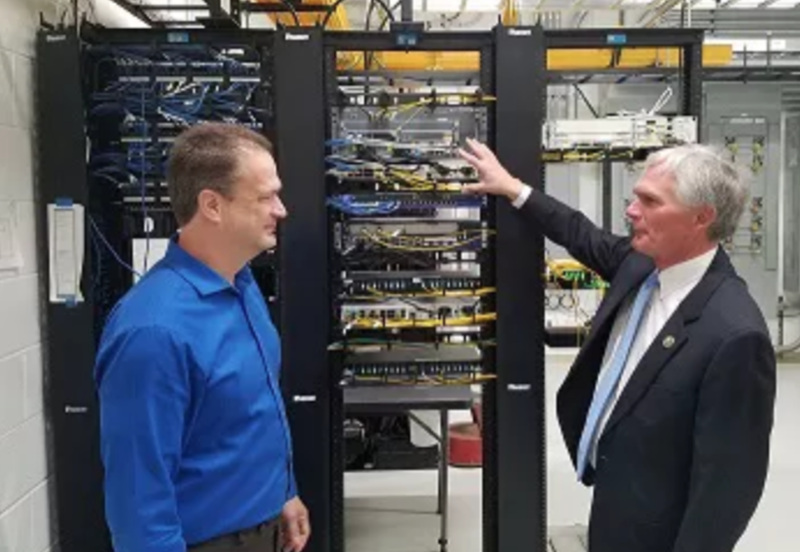 State Rep. Paul Thissen (D) and Sen. Ron Latz (D) announced plans to introduce legislation that would require ISPs to “ensure neutrality on all public networks” by prohibiting blocking, throttling and paid prioritization schemes from ISPs in local and state contracts. The bill will also seek to ensure that Minnesota state agencies “favor companies that agree to abide by net neutrality principles.” The bill has not yet been formally introduced the state Senate. Minnesota Attorney General Lori Swanson (D) has joined the multi-state lawsuit against the FCC. Mississippi Attorney General Jim Hood (D) has joined the multi-state suit against the FCC. Nebraska state Sen. Adam Morfeld (D) introduced Legislative Bill 856, which would change communications provider requirements under the Nebraska Telecommunications Regulation Act in order to prevent ISPs from blocking, throttling or otherwise impacting data traffic in Nebraska. The bill is awaiting a public hearing. State legislators Nilsa Cruz-Perez (D) and Patrick Diegnan (D) introduced Senate Bill 1577, the “New Jersey Net Neutrality Act,” which prevents any ISPs in New Jersey from blocking or throttling traffic, or engaging in paid prioritization, in services offered to residents and businesses. An identical bill, Assembly Bill 5257, was introduced in the state Assembly, sponsored by Annette Quijano (D) and five other Democrats. 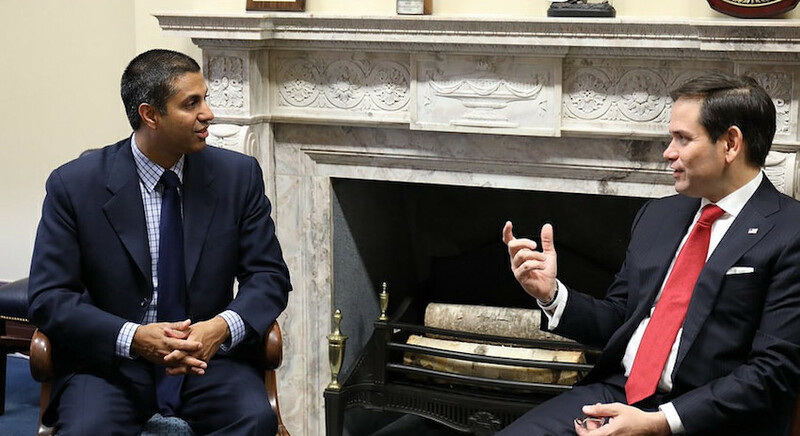 New Jersey Governor Phil Murphy issued an executive order in early February which requires ISPs with state contracts to adhere to net neutrality principles. New Jersey Attorney General Gurbir S. Grewal has joined the multi-state suit against the FCC. New Mexico state senator Howie C. Morales (D) introduced Senate Bill 39 that would modify the state’s Unfair Practices Act to ensure that ISPs do not block or throttle traffic, or engage in paid prioritization. The bill is currently in committee. Morales, along with Rep. Bill McCamley (D) and Rep. Carl Trujillo (D) also introduced a Joint Memorial “requesting that the New Mexico Congressional Delegation encourage Congress to review the FCC’s decision to repeal the net neutrality rule and the FCC’s rulemaking process.” New Mexico’s Attorney General Hector Balder (D) has joined the multi-state suit against the FCC. New York Sen. David Carlucci (D) and Assemblywoman Patricia Fahy (D) filed two versions of a bill that introduces a set of requirements for ISPs operating within the state to meet in regards to net neutrality. Senate Bill 7183 would also modify the state’s public service law to include ISPs, and would task the Commission to “develop and maintain a statewide plan for the monitoring of internet service providers, including the annual certification that internet service providers comply with the internet service neutrality requirements.” The bill would amend the state finance law to bar ISPs that do not uphold net neutrality rules from obtaining state and local contracts. The Assembly version of the bill has seen 38 other legislators sign on as co-sponsors, including Independent Fred Thiele and Republican Karl Brabenec. New York State attorney general Eric Schneiderman has filed suit against the FCC, along with 20 other state Attorneys General. The announcement came after the AG’s office released its findings of an investigation into the FCC’s commenting process on the issue of net neutrality. The investigation found up to 2 million comments were submitted to the FCC fraudulently, using the names of real US citizens. State Rep. Jennifer Williamson (D) and Rep. Paul Holvey (D) have included net neutrality protections into an online privacy bill filed last year, House Bill 4155. The bill would bar the State of Oregon from awarding contracts to ISPs who do not adhere to net neutrality principles. The bill, which has 24 Democrat cosponsors, is currently in committee. State Sen. Larry Farnese (D) introduced Senate Bill 1033, the Open Internet Protection Act, which would prohibit ISPs from blocking, throttling traffic or engaging in paid prioritization schemes. The bill would also bar and state agency or “political subdivision” from doing business with, offering tax credits or awarding grants to ISPs who do not adhere to net neutrality; and ISPs that do not comply with these regulations would be found in violation of the state’s Unfair Trade Practices and Consumer Protection Law. The bill, which has three Democrat cosponsors, is currently in committee. Pennsylvania Attorney General Josh Shapiro (D) has joined the multi-state suit against the FCC. State Rep. Aaron Regunberg (D) introduced House Bill 7422, the Net Neutrality Protection Act of 2018, which bars state agencies from purchasing Internet service from ISPs that “fail to provide unbiased access to the Internet, through a commitment to the net neutrality principles.” The bill, which has three Democrat and one Republican cosponors, is currently in committee. Rep. Brian Kennedy (D), meanwhile, introduced House Bill 7076, a bill that would amend the state’s “Community Antenna Television Systems” general laws to include regulations and jurisdiction for ISPs who are awarded contracts by the state or local bodies to enforce compliance with the state’s net neutrality rules. The bill, which has four Democrat cosponsors, is currently in committee. On the Senate side, Sen. Louis DiPalma introduced Senate Bill 2008, which extends the net neutrality rules to any ISP offering broadband service in the state. The bill is currently in committee. Rhode Island Attorney General Peter Kilmartin (D) has joined the multi-state suit against the FCC. State Rep. J.E. Smith (D) introduced House Bill 4706, the South Carolina Net Neutrality Protection and Maintenance Act, which would prevent any ISP operating in the state from engaging in blocking, throttling or paid prioritization. Failure to adhere to the state’s net neutrality principles “constitute an unfair or deceptive act in trade or commerce and an unfair method of competition,” the bill declares. The bill is currently in committee. State Sen. Reynold Nesiba (D) and 11 other Democrats introduced Senate Bill 195, which would prevent state and local agencies from awarding contracts to ISPs that do not adhere to net neutrality principles. The bill is currently in committee. State Sen. Lee Harris (D) introduced Senate Bill 1746, the Tennessee Internet Consumer Protection and Neutrality Act. State Rep. John Ray Clemmons (D) introduced the same bill as House Bill 1755 in the state’s House of Representatives. The bills prohibit any ISPs operating in the state to engage in throttling, blocking or paid prioritization, and also prevents states agencies from contracting with ISPs that fail to adhere to the net neutrality principles. Both bills are currently in committee. introduced House Bill 680, which aims to establish “consumer protection and net neutrality standards applicable to Internet service providers in Vermont.” The bill, which has 41 cosponsors that include Democrats, Independents, Progressives and one Republican, would require all ISPs operating in the state to obtain a net neutrality certificate, administered by the Vermont Public Utility Commission in order to provide broadband service to residents within the state. It would also create a “ground truth” testing mechanism, in order to “create a single objective statewide Internet speed test that permits customers to test their own broadband Internet speed and submit the results to the [public utility commission] to determine what Internet speeds consumers are receiving and where Internet service providers may be blocking,impairing, or degrading Internet traffic or content.” The bill would see the net neutrality standards enforced under the state’s Consumer Protection Act. The bill is currently in committee. Virginia Rep. Lee Carter (D) introduced House Bill 705 in early January aimed at preserving net neutrality within the state. The full bill reads: “A provider of broadband services shall be prohibited from offering or renewing services to consumers within any locality in the Commonwealth in which certain media is throttled, blocked, or prioritized on the basis of its content, format, host address, or source.” The bill died in committee last week. State Rep. Drew Hansen introduced House Bill 2282 in early January, which would bar any ISP operating in the state from blocking, throttling or engaging in paid prioritization. The bill would see that net neutrality principles “are matters vitally affecting the public interest for the purpose of applying the consumer protection act,” and gives the state’s Attorney General the power to enforce those rules. The bill, which has six Republican cosponsors and 45 Democrat cosponsors, has passed the state’s House with bipartisan support and is now being considered by the state Senate. The bill is currently in committee. State Sen. Richard Ojeda introduced Senate Bill 396, the West Virginia Net Neutrality Act, to prohibit ISPs from blocking, throttling or engaging in paid prioritization. It also deems violations of these rules to “an unfair or deceptive act or practice” in violation of the West Virginia Consumer Credit and Protection Act. The bill would enable consumers to bring suit against ISP violators in private civil action. The bill has 10 Democrat cosponsors and one Republican cosponsor, Patricia Rucker. However, Rucker has since requested to be removed from the list. The bill is currently in committee. State Sen. Jon Erpenbach (D) and Rep Jimmy Anderson (D) have introduced Assembly Bill 908 that would prevent the state agencies from awarding contracts to ISPs that do not adhere to net neutrality principles. A similar bill, Senate Bill 740, was introduced to the state Senate by Sen. Erpenbach and Sen. Chris Larson (D), with 18 Democrats. Sen. Larson (D) and Rep. Jonathan Brostoff (D), along with 16 other Democrats, have also introduce Assembly Bill 909, which would reinstate net neutrality rules for ISPs operating within the state, and directs the state’s Department of Agriculture, Trade and Consumer Protection to “create and implement a complaint process for responding to violations of the bill’s provisions.” All three bills are currently in committee. Understanding the partisan debate around Net Neutrality regulation comes down to defining how Title I vs Title II classification changes the rules around broadband. After a heated national debate about the importance of net neutrality enforcement, the FCC voted 3–2 along party lines to adopt the Restore Internet Freedom Order , a declaratory ruling to repeal the regulatory Title II classification, put in place by former FCC Chairman Tom Wheeler in 2015, that had enabled the FCC to enforce net neutrality rules among Internet service providers (ISPs). Supporters of net neutrality have argued that, without Title II classification, which treated broadband service as a utility-like “common carrier” service akin to telephone lines in the 20th century, ISPs will be free to block or throttle data, services and applications traveling across their networks for financial or strategic gain. Advocates of the repeal, which include ISPs Comcast, Cox, Charter, Verizon and AT&T, along with telecom industry trade bodies, have argued that Title II classification has only served to undermine ISPs’ abilities to invest in their broadband networks and innovate new technologies. Title I status, Preemption, and Exemption all produce issues for states that want to regulate broadband at the state level. Title I vs Title II: Why does it matter for the public? The thrust of the FCC’s order was to remove the Title II classification from Internet services. 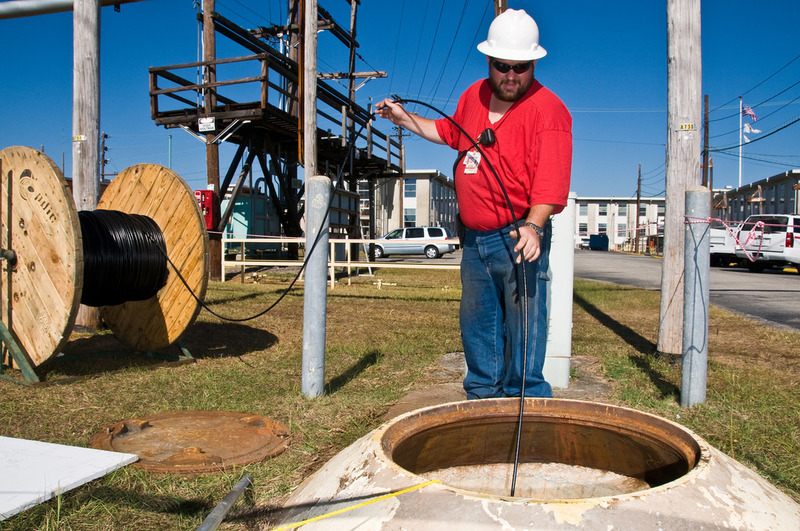 Title II classification, under the Communications Act of 1934 , establishes certain services as “common carrier” services that are regulated by the FCC as a utility, meaning that the service is deemed to be vital to the public interest and is regulated as such. But with the Restore Internet Freedom Order, FCC has reclassified Internet services as Title I, also known as “information services,” which are subject to fewer federal and state regulations. The ambiguity around the classification of Internet services stems from the history and development of Internet technologies. Telephone companies such as AT&T and Verizon, which are regulated as common carriers under Title II, were the first to offer Internet services over telephone lines. But cable companies, which began offering Internet services with the advent of DOCSIS technologies, were regulated as information services under Title I. After a series of legal challenges, the FCC voted to classify all Internet services as Title I information services. In the past 10 years, there have been at least 13 cases  of ISPs violating net neutrality, but all attempts by the FCC to step in and enforce net neutrality rules were struck down by the courts, who argued that the FCC didn’t have authority to regulate ISPs classified as Title I services. In 2015, under the leadership of former chairman Tom Wheeler, the FCC was able to reclassify Internet services as Title II, and could therefore fully enforce net neutrality. That order was repealed with the recent Restore Internet Freedom Order, thereby removing the FCC’s ability to enforce net neutrality, and handing over regulatory authority to the Federal Trade Commission. Some state legislators have been reluctant to attempt to create a set of net neutrality state laws or rules that would apply to ISPs operating within the state because of a preemption clause contained in the FCC’s Restore Internet Freedom Order. Preemption clauses refer to statements which attempt to preempt a state’s response to a regulatory order. The FCC’s order claims the regulation of broadband should be governed at the federal level, and that the FCC “should exercise our authority to preempt any state or local requirements that are inconsistent with the federal deregulatory approach we adopt today.” It argues that state or local regulatory approach for broadband service would “impair the provision of such service,” by forcing ISPs to meet inconsistent regulatory rules across the states they operate within. ISPs Comcast, Verizon, and the mobile industry trade body CTIA, had all submitted ex parte filings to the FCC ahead of the net neutrality vote, urging it to include a preemption clause within the Restore Internet Freedom Order. The FCC has used preemption in a number of regulations, but under legal challenges, the preemption clauses don’t always stand up to muster. In 2015, the US Sixth Circuit Court of Appeals struck down the FCC’s attempt to preempt state laws governing municipal broadband networks. The legal challenge came just after the FCC had re-classified Internet service as a Title II “common carrier” service, and was considered a regulatory reach at the time. The courts found that the result of the FCC’s preemption “essentially serves to re-allocate decision-making power between the states and their municipalities,” without a clear statement from Congress giving the FCC the prerogative to do so. In other words, the court found that the FCC cannot preempt state laws in order to prevent states from doing something if states are not violating any federal law or FCC regulation that directs states to do otherwise. In a separate 2003 case, the courts upheld an FCC’s preemption which prevented states from regulating Voice over Internet Protocol (VoIP) services. In that case, the FCC argued that states’ regulations of VoIP services would violate the “long-standing national policy of nonregulation of information services.” At that time, Internet services were classified as Title I services. The Eighth Circuit Court of Appeals agreed with the FCC’s preemption in that case, but not because of the Title I classification. Instead, the courts agreed with the “impossibility exception,” a rule which stipulates that the FCC can preempt states if the intrastate components of the service – meaning the parts of the service that occur within state lines – cannot be easily separated from the interstate components, ie the parts of the service that cross state lines. The court also noted that future advancements in technology may make the impossibility exception moot. “If, in the future, advances in technology undermine the central rationale of the FCC’s decision, its preemptive effect may be reexamined,” the court said. What will happen next in the debate over state net neutrality laws? What’s next for the broadband debate? For better or worse, the issue will likely be decided by the majority in power at the FCC, not the majority in power in individual states. While 22 Attorneys General are suing the FCC, the FCC could take legal action against any and all states that enshrine new net neutrality rules into law. The ISPs, themselves, may also filed suit against states that attempt to enforce their own net neutrality state laws or rules. It’s not clear who has the upper hand here: the states that want to create their own net neutrality rules, or the FCC, which wants to prevent them from doing so. Legal experts seem to agree that both positions on the issue have waded into a gray area. It seems likely that ISPs will challenge state laws governing net neutrality if and when they become law. But it’s unclear if the courts will be convinced by the FCC’s arguments for authority in its preemption clause. 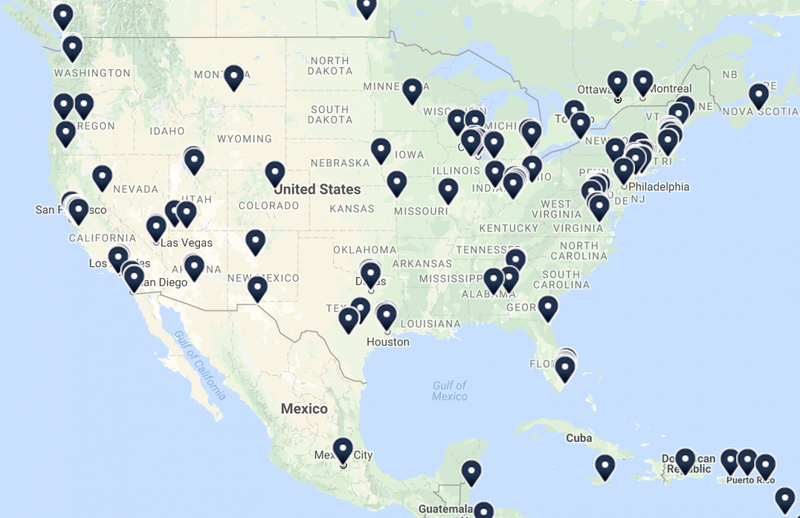 The post State-by-State Net Neutrality Laws Breakdown appeared first on Broadband Now. The FCC’s 2018 Broadband Deployment Report has been raising eyebrows in Net Neutrality circles thanks to its move to classify satellite as fixed broadband — in spite of ongoing latency and pricing issues with satellite technology. The 2018 FCC report on broadband deployment displays terrestrial service as usual, but leans on satellite statistics to boost coverage statistics. Image via FCC Broadband Deployment Report 2018, p. 16. The media response has been pretty standard: the left presents it as pandering to ISPs. The right is largely treating it as a chance to promote the benefits of deregulation. In this analysis we’ll look at where satellite stands today in terms of performance and pricing, and whether or not it makes the grade for bridging the digital divide in rural America. Is Satellite Internet Good Enough for Modern Internet Use? Limited data allowance (caps around 10–50MB/month. High pricing compared to cable, DSL, and Fiber. As discussed above, the FCC conclusion on this point is contested and closely tied to Net Neutrality/Internet Freedom debates. While contract length isn’t discussed at length in the FCC’s reports, the other two points are touched on, if only in footnotes. Should “Latency” Be a Broadband Benchmark? As it stands, the FCC uses only two metrics to determine fixed broadband quality: download speed and upload speed. The issue of latency, or “ping,” is left out. Latency refers to the “lag” on a connection, meaning the milliseconds it takes for data to travel from your computer to a remote server and back. Wired connections like cable or DSL have latency measurements well below 50ms. Satellite, on the other hand, generally measures closer to 700-800ms or more. This results in a measurable lag on video communications, gaming, and other time-sensitive applications. This matters because the FCC broadband definition currently requires fixed service to provide a minimum of 25 Mbps download and 3 Mbps upload. By this definition, satellite has just recently been able to meet the minimum. 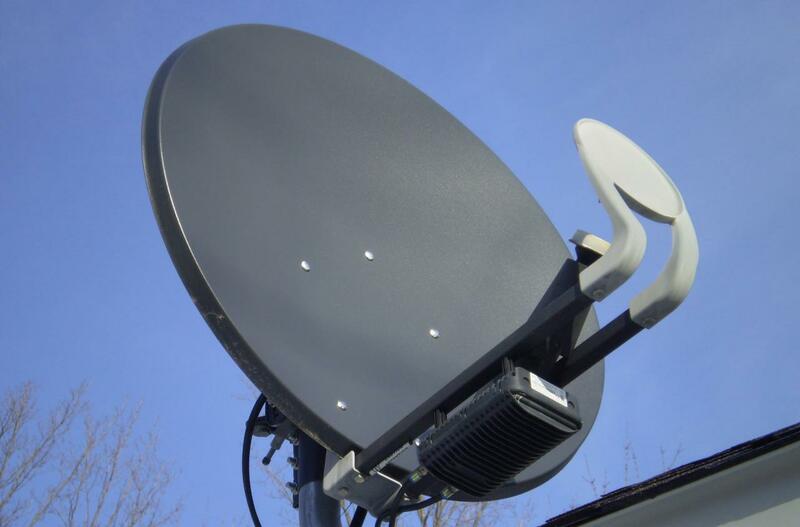 Both major US providers (HughesNet and Viasat/Exede) launched major satellite upgrades in the past couple years. Satellite data has been included in Broadband Report statistics since 2016, but this is the first year that satellite exceeded the minimum broadband speed benchmarks and meaningfully impacted service statistics. To address this issue, it was expected that the FCC might introduce latency as a factor now that satellite is often meeting or exceeding those minimum speeds. However, the 2018 report under FCC Chairman Ajit Pai declined to do so. NTCA argues that some types of broadband, such as satellite, may not meet a particular latency target and should be excluded from our section 706 analysis. By contrast, ViaSat objects to any latency standard, arguing that the Commission should not single out latency among all the performance characteristics that affect the end-user consumer experience. Verizon and CTIA also oppose adoption of a latency benchmark, urging the Commission instead to focus on consumer needs and experience. … We [FCC] decline to adopt a latency benchmark. Should Pricing and Data Caps Factor Into Coverage Reports? 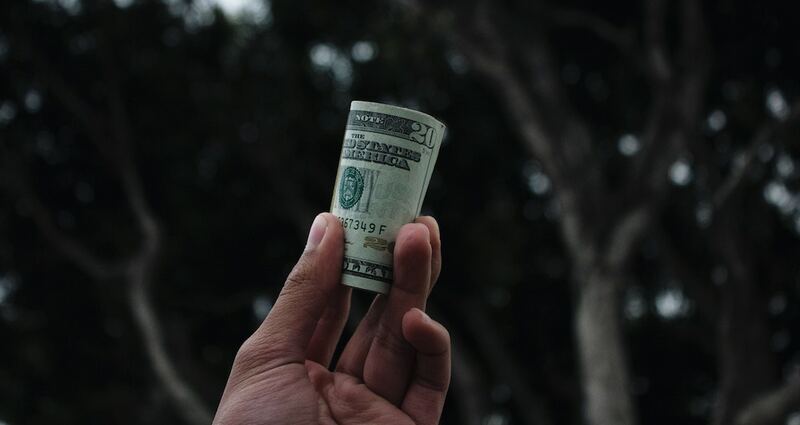 While the pricing for satellite Internet plans is similar to Internet-only plans from cable and fiber providers, we generally steer customers towards wired options when they ask. Practical Internet Access: Are Two-Year Contracts an Access Barrier for Low-Income Consumers? 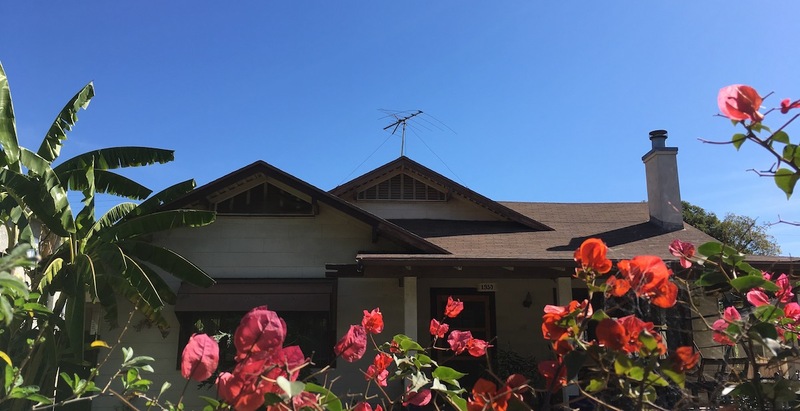 The cost of installing a reception dish with a minimum two-year contract is not realistic for many low-income consumers, who often live in temporary or rental housing. Finally, the elephant in the room that somehow didn’t get air time in this report: multi-year contracts. As of 2018, the minimum contract length available from a residential satellite Internet provider like HughesNet is two years. Again, this isn’t entirely unreasonable considering the economics of the satellite business. Providing service is expensive, and they have difficulty making money off short-term customers. For these reasons, many Digital Divide groups consider satellite to be a problematic solution to broadband inequality. As we’ve reported before, Broadband Deployment reports and other “fact sheets” from the FCC usually have more to do with left/right commissioner disagreements than with actually open-sourcing data about broadband adoption in the US. The 25/3 Mbps speed benchmark, for example, tends to change with administration changes rather than consumer Internet expectations. Obama-era regulations were responsible for the current 25/3 Mbps benchmark, and the Trump-era FCC proposed lowering speeds needed to “serve” consumers within their first year in the office. Regardless of where you stand on broadband regulation, it’s important to remember that FCC presentations of data are strongly colored by the party in power. It used to be easy to say “only get satellite Internet if you have to.” Now that the speeds have increased thanks to launches like Gen 5, it often beats DSL in terms of speed. Meanwhile, DSL networks are getting upgrades extremely slowly due to the high cost of replacing the lines with fiber optics. Future-facing analysts often cite Elon Musk’s low-orbit satellite mesh project as a beacon of hope for lowering cost and boosting performance of rural broadband. The question is, at what point will the price and logistics of service compete directly with wired service? For now, the FCC seems to be moving to call the existing services “good enough,” in keeping with the light-touch approach to telecom regulation. Whether or not this low-pressure approach drives innovation in the consumer broadband market or not remains to be seen as 2017–2018 data becomes available early next year. The post FCC Concludes Satellite Internet Is Good Enough for Rural Broadband appeared first on Broadband Now. The official FCC broadband definition is a minimum of 25 Mbps download and 3 Mbps upload. This change was also in keeping with 2010 FCC Chairman Tom Wheeler’s focus on drawing attention to the “digital divide” in rural areas, as increasing the minimum speed results in less favorable coverage statistics. 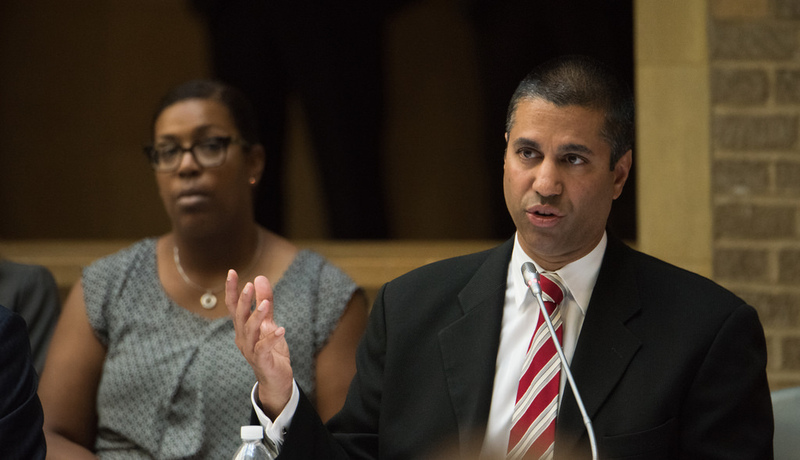 FCC Chairman Ajit Pai faced criticism in 2017 and 2018 for his proposal of modifying broadband coverage benchmarks. Image via FCC Flickr. In his proposal, Pai cited the widespread access to high-speed mobile as potentially sufficient for basic Internet access. In the past, subscribers were only considered “served” if they had access to both 25 Mbps download / 3 Mbps upload wired broadband and mobile connectivity. This would be the first-ever reduction in the FCC standard for consumers to be considered “served” with broadband Internet. However, contrary to what has been reported widely in the media, this would not be a replacement for the wired broadband 25/3 Mbps down/up standard. …It would, however, cause the percentage of Americans considered “covered” by the FCC to jump dramatically. we propose to maintain the current speed benchmark of 25 Mbps download and 3 Mbps upload (25 Mbps/3 Mbps) for fixed broadband, and we also seek comment about other potential benchmarks. It’s worth noting that the only other major change in the broadband benchmark took place under Chairman Julius Genachowski of the early Obama administration. It [4 Mbps download, 1 Mbps upload] is the minimum speed required to stream a high-quality —even if not high-definition—video while leaving sufficient bandwidth for basic web browsing and e-mail, a common mode of broadband usage today that comports directly with section 706’s definition of advanced telecommunications capability. 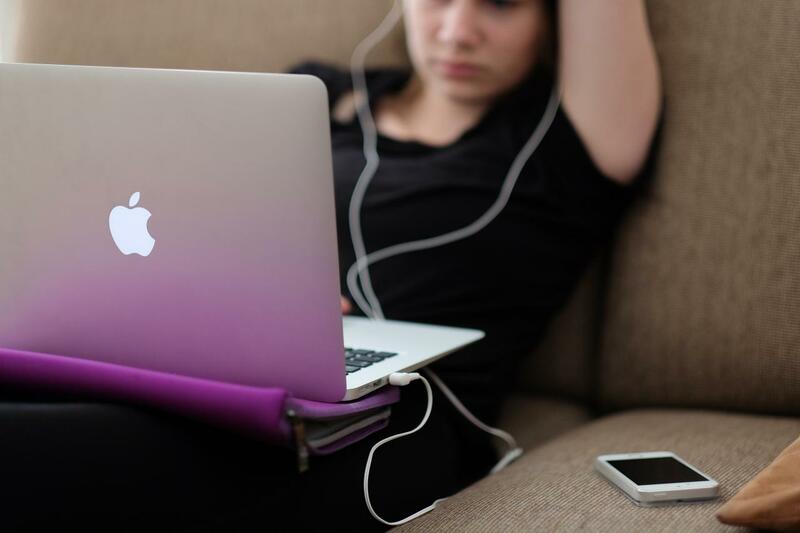 Prior to the 2010 change, video streaming was widely viewed as a luxury. Considering the advancing popularity of video conferencing and remote teamwork, it’s not surprising that the FCC broadband definition would be upgraded. Interestingly, the FCC’s own speed guidelines define the minimum speed/bandwidth needed for video conferencing as 1 Mbps. Clinton-era “light touch” telecom regulation has been at the center of debates over broadband standards since 1996. 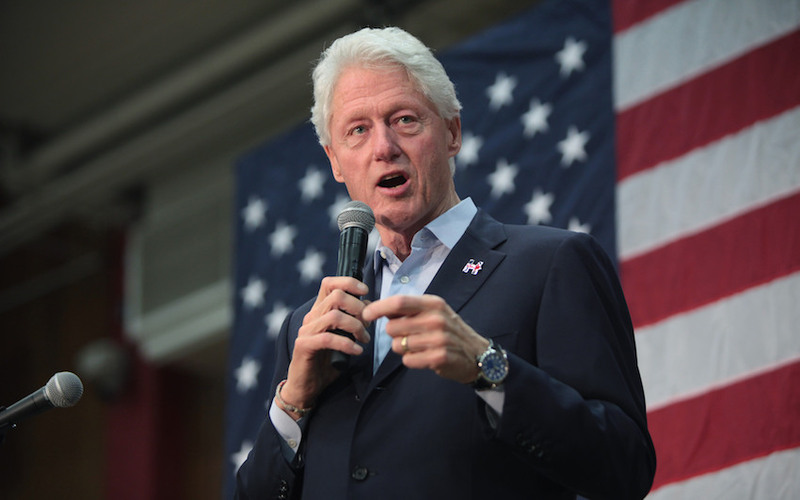 Broadband Progress Reports issued 1999–2009 adhered to the original broadband definition of 200 Kbps established in the Telecommunications act of 1996 — the Clinton-era order that required the regular publishing of Broadband Progress Reports in the first place. Reports in this time period didn’t account for video as a necessity for basic service, although by 2009 the definition was well out of date for real-world users who were already getting accustomed to video platforms like YouTube (launched 2005). However, even before the the upgrade to a 4 Mbps benchmark, annual reports classified speed into tiers and reported individual statistics according to speed range. This method separated “basic service” from the more advanced telecommunications capacity expected in urban areas. Overall, FCC Broadband Reports have been as much about the conversation they start as the data inside. Conservative parties tend to conclude that broadband is being deployed fast enough, and that increased scrutiny and regulation isn’t the answer to increasing competition. This can be seen in the current administration’s proposal to lower coverage standards, which would create more favorable statistics to include in future progress reports. 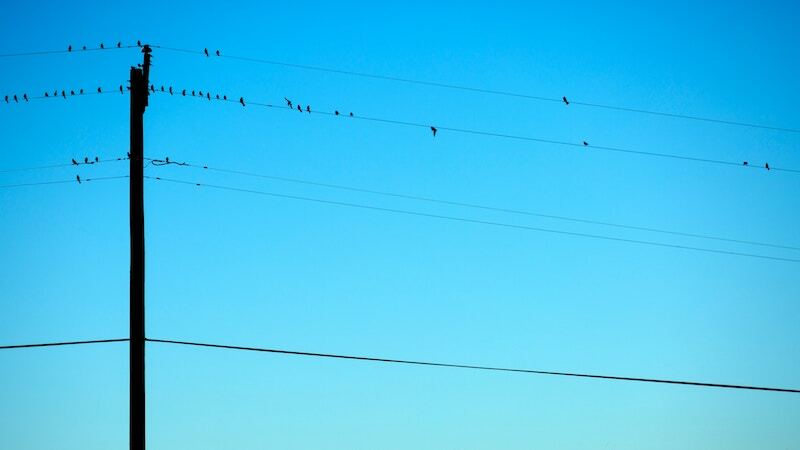 Regardless of which side you fall on, it’s been frustrating to see that most actual upgrades to rural networks comes either as a requirement in contested merger agreements, or from small fixed wireless providers. This post will be updated to reflect changes in the definition of Broadband from 2018–2020. The post FCC Broadband Definition Has Changed Before and Will Change Again appeared first on Broadband Now. Data in the 2018 FCC International Broadband Data Report  shows that US broadband speeds have climbed the charts to #10 among developed nations. As of 2016, the US pulled ahead of Norway, Finland, and several other European countries. However, pricing analysis in the report shows that in spite of improving speeds and infrastructure, the prices Americans pay for broadband are still “among the worst in the developed world,” amounting to an average $58/month. The full report is available via the FCC. Our analysis focuses on what the speed and pricing results mean today for US broadband competition. The USA jockeyed their way five points up the charts from 2014–2016, while France managed a rapid 10 point rise. 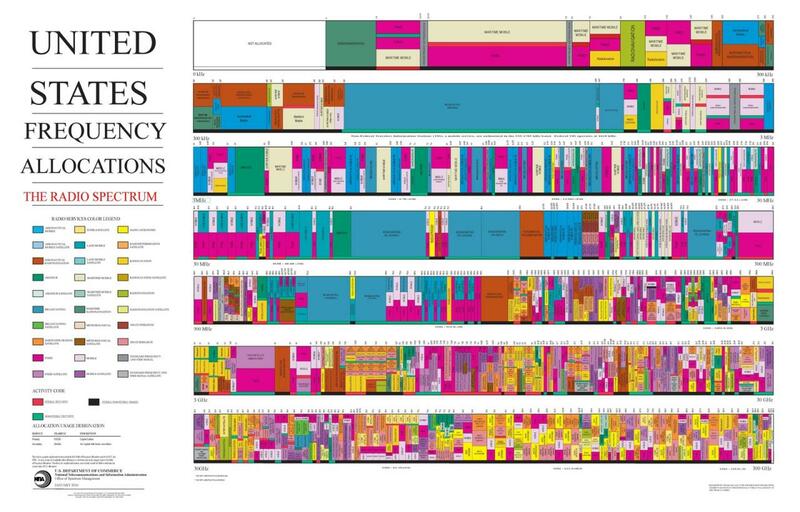 Diagram via the 2018 FCC International Broadband Data Report. France made one of the largest improvements in speed, from #21 to #11 between 2014–2016. Long term, we expect that integration with Google searches for “speed test” will make M-Labs results more valuable so far as localized performance estimates — at least within the US. The pricing measurements are detailed in the appendix of the 2018 FCC International Broadband Data Report, and worth taking a look at for the mathematically inclined. Methodology is detailed on page 52 in the report appendix. To summarize for the rest of us: while speed rankings is based on a mix of advertised speeds and privately aggregated real-world speed test results, price rankings are based on advertised pricing alone. Unlike previous years, this year’s report includes bundled plans as well as Internet-only “standalone” plans, which significantly affect the results for the US market. The “bundling” strategy used by many cable operators complicates the math for comparing nations since the regulations around “bundled” services such as Internet/TV varying from country to country. Overall, the FCC report found that the US is the outlier in terms of the popularity of bundled plans, estimating that a surprising 75% of consumers receive discounted Internet through some form of TV and/or phone bundle. Densely populated areas tend to have faster broadband thanks to economies of scale for infrastructure development. This trend benefits smaller, densely populated countries like South Korea. The US is often held up as an example of Internet infrastructure gone wrong. Meanwhile, small and densely populated countries like South Korea are often held up as shining examples of Internet infrastructure done properly. Is this fair? Not always, since the political, infrastructural, and economic conditions are so different in either country. It’s difficult to justify a direct pricing comparison between two radically different countries like, say, France and Japan. Our team was encouraged to see this year’s report take a more measured stance on how population density, economic standing, and other factors play into “ranking” results. The model cited in the “key insights” section above draws from the model that measured for population density, income levels, and education levels. The #14 ranking in this model still didn’t paint a very flattering picture of US pricing for services. Regardless, it puts the US squarely in the center of the charts rather than at the very bottom. Partisan disagreements aside, seeing the US rankings improve over the past five years has been encouraging for everyone involved. 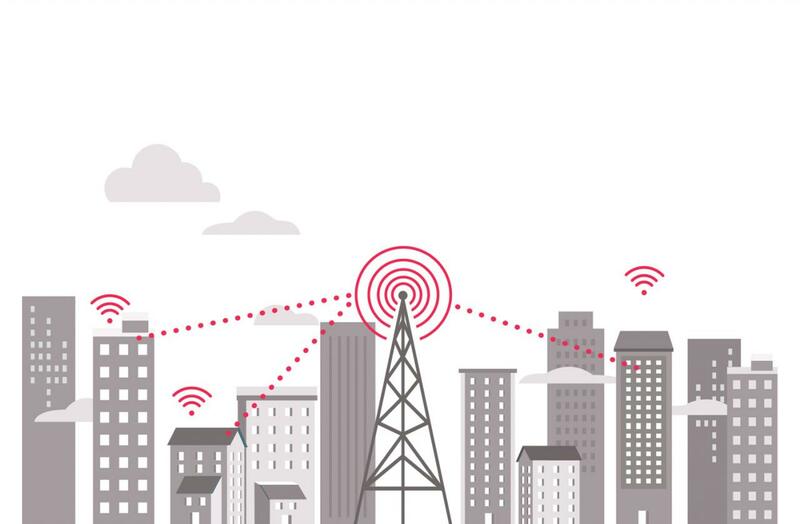 Wireless and fiber development alongside an emphasis on federal funding for closing the digital divide are expected to continue improving broadband availability and pricing over the coming years. Since this data is often a year or more behind the times by the time it reaches the public through FCC releases, we’ll have to wait until later in 2018 to find out how the scoreboards react to the current deregulatory approach to solving these critical challenges in American infrastructure development. The post 2018 FCC International Broadband Data Report: Key Insights appeared first on Broadband Now. Haggling with reps is no fun, but with a little persistence you can usually get them to cut some channels in exchange for a deal. The trick: have information on competing promotional plans from other providers on-hand when you call, and have a good payment history so they’ll be incentivized not to let you switch. I’ve shared some more tips on this process here. LifeHacker has a nice rundown on technical specs, and how to make your own if you’re really pinching pennies. The post How to Save Money on Your Internet and TV Bill appeared first on Broadband Now. The war over how to regulate the internet has a key problem: the process for creating regulation is so complex that even vehement supporters and opponents of Net Neutrality and other key issues often have little knowledge of where this regulation actually comes from, or how it’s created. Interestingly, the group that’s responsible for managing these regulations, the Federal Communications Commission (FCC), is quite small. Just five commissioners cast votes on everything from Next Gen TV standards to wireless spectrum allocation. These five commissioners have a huge impact on the lives of every American who uses the Internet — which is to say, virtually all of us, with the exception of a few hermits. In this breakdown, we’re going to take a look at which way each FCC commissioner leans on current issues like Net Neutrality, then dive into an outsider-friendly answer to what the FCC actually does. In broad strokes, Chairman Pai is in favor of repealing and replacing Net Neutrality with “light-touch” regulation similar to what has been employed before during the Clinton administration. He believes that too much preemptive legislation is actually anti-competition, and asserts that it is a major stumbling block on the road to bolstering our aging communications infrastructure, especially in rural and low-income areas. Clyburn is a strong advocate for enhanced accessibility in communications for disabled citizens, and works with the representative groups for the deaf and hard of hearing. Clyburn supports an open marketplace, and does not have a far-left position on the internet, but instead chooses to go for targeted regulations. 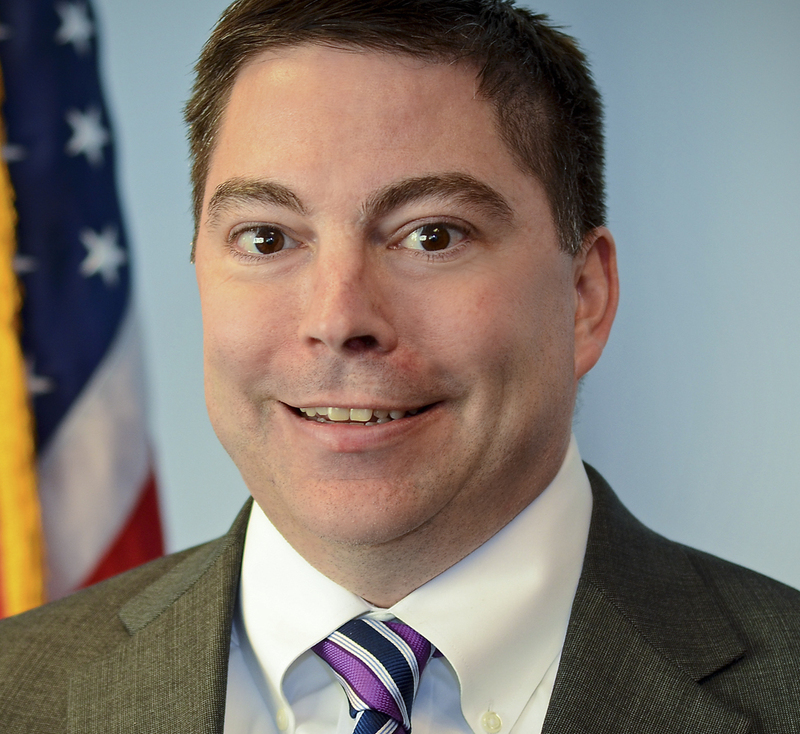 O’Rielly’s stance on net neutrality is that the current regulations are too burdensome, instead favoring a replacement set of policies that promote free market economics. Similarly to the other Republican members of the FCC Commission, Carr has a strong focus towards free market economics, and wants to dismantle the burden of government regulation on companies, specifically with regards to net neutrality. Chairman Ajit Pai recently appointed Carr to lead the agency’s wireless infrastructure proceedings, and Carr is moving forward by favoring the free market to get there, and to relieve a lot of FCC rules that in his view are overstepping their boundaries. Translation: the FCC is largely responsible for the fate of the Internet, as well as other services like TV and radio that are quickly moving towards Internet-based transmission. Originally, the vision for the agency was that it would regulate interstate and foreign communications by wire and radio in the public interest. That scope has expanded a quite a bit today, as the Internet swooped in to “disrupt” everything from news to communication. The commission itself is composed of five members who are appointed by the President and confirmed by the Senate. One of these members is designated by the President as Chairman, while the rest act as commissioners on the leadership council. Only three members can be affiliated with the same political party at a time, and none are allowed to have any financial interests related to official commission business. 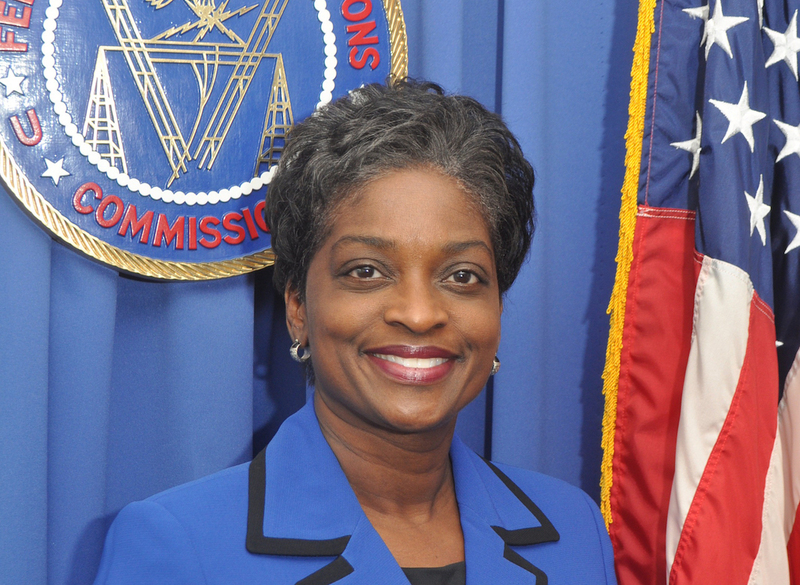 What does an FCC Commissioner do? FCC Commissioners serve terms that are five years in length, unless they are filling an unexpired term. Their primary role is to establish and put forth legislation that responds to the communications needs of Americans as they stand today. They also serve as teachers and advocates of various public initiatives in the realm of communications. The Commission itself meets once a month for an open meeting to discuss the latest issues and proposed regulations. They keep an open calendar of these meetings, and meetings are followed up by press releases detailing their decisions alongside commissioner statements. Why does the FCC matter? If the FCC’s classifications and regulations seem too overwhelming (and borderline self-defeating at times), you may be tempted to dream up a world where the agency doesn’t exist at all. Despite this, the agency has a few functions that just about everyone can agree are important for today’s tech-driven world. 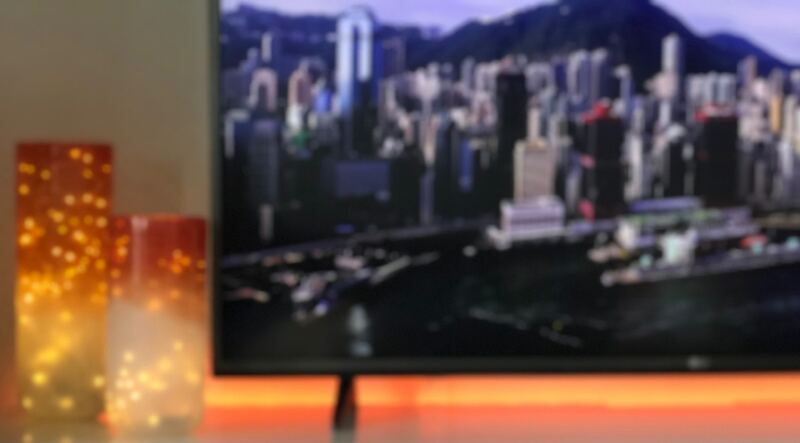 New and innovative standards like Next Gen TV are exciting and packed with advancements, but they are also rife with controversial user tracking initiatives that, if left unregulated, could represent a tangible issue for many. In this case, the FCC’s role revolves around putting in place regulations that seek to protect consumers while still allowing for technological progress to run its course. Another example of the FCC’s potential value lies in ensuring that companies are properly incentivised to update and modernize our aging communications infrastructure. Though opinions differ on just how to do this, both sides of the aisle largely agree that it’s something that needs to be done. Regardless of your political affiliation, almost everyone can agree that realigning the FCC’s approach to broadband regulation to encourage more competition is a positive goal. Unfortunately, government isn’t known for moving quickly when it comes to technology — as anyone who’s had to navigate a .gov website can attest to. Now, the FCC looks set to announce their formal vote to rescind the Internet protections put in place by the Obama administration imminently, with the actual vote likely to take place in December. Considering the 3-2 Republican majority currently, it is likely to pass. Regardless of where you stand on the issue, how the committee proceeds from here will likely be pivotal in shaping the Internet of tomorrow. 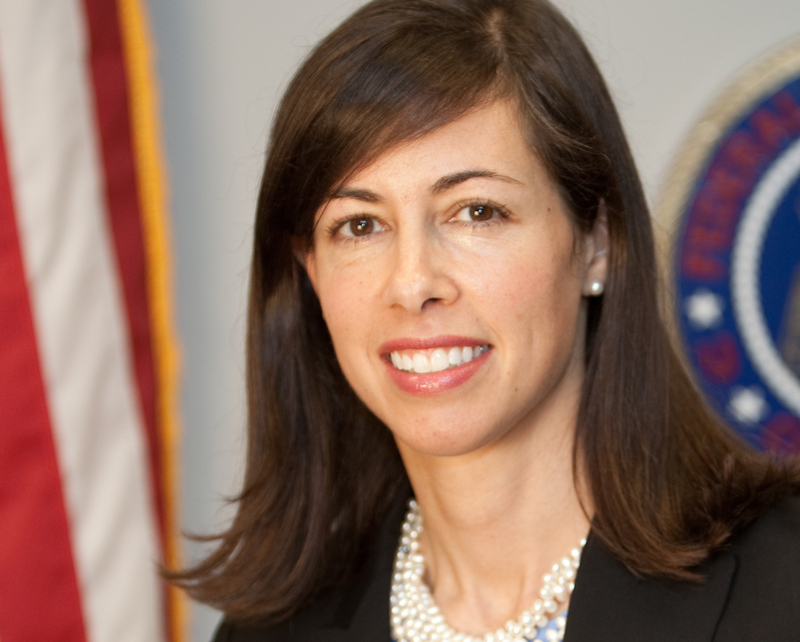 The post Who Are the FCC Commissioners and Where Do They Side on Net Neutrality? appeared first on Broadband Now. Why Is the American Internet Empire Crumbling? The colossal labyrinth of pulses and wires we refer to as “the Internet” is sort of like the jumble of wires and plugs behind your uncle’s VCR. Sure, it works — but it’s largely improvised, and for the love of God don’t touch anything. Much like that old VCR, America’s network infrastructure is often a bit dated in terms of infrastructure. This has become increasingly clear in the past year as policy changes around Net Neutrality and regulatory standards have been riling up consumers, Internet providers, and Internet access advocacy groups alike. Overall, one thing is clear; the US has some issues when it comes to the modern innovation it helped give birth to. The heart of the trouble goes deeper than policy changes around how content is delivered. While it’s popular to blame providers, the underpinnings of the issues are in truth much more complex. The politics problem: US regulation is generally more relaxed than other developed countries. The regulations that do exist tend to be outdated, and companies aren’t incentivized to compete directly. The “First Mover” problem: America invented the Internet, and the “technology debt” of all that money sunk into now-outdated copper networks is hard to justify building over at scale. Countries like South Korea that are known for incredible Internet infrastructure have the benefit of building out their digital infrastructure from scratch on mature technologies, with all the benefit of our mistakes and hindsight. Before diving directly into the issues (and what can be done about them), however, let’s briefly take a look at how the web you’re familiar with today came into existence, starting right at the peak of the Soviet Union’s influence. From there, we’ll explore the nuances of the way your connection is structured and ultimately delivered to your doorstep–and why it’s a fragile system in need of change. On October 4th, 1957, the Soviet Union surprised the world by launching the first man-made satellite into orbit around the Earth. Known as Sputnik, the device didn’t have much in the way of technology onboard its beachball-sized hull, but that didn’t stop Americans from beginning to feel that they were actually falling behind in terms of technological progress. As a result of this revelation, a greater emphasis on developing and researching technological projects began to take shape at all levels of American society. From the government to the private sector, and even in the classroom, science was nudged towards the forefront of the people’s interests. 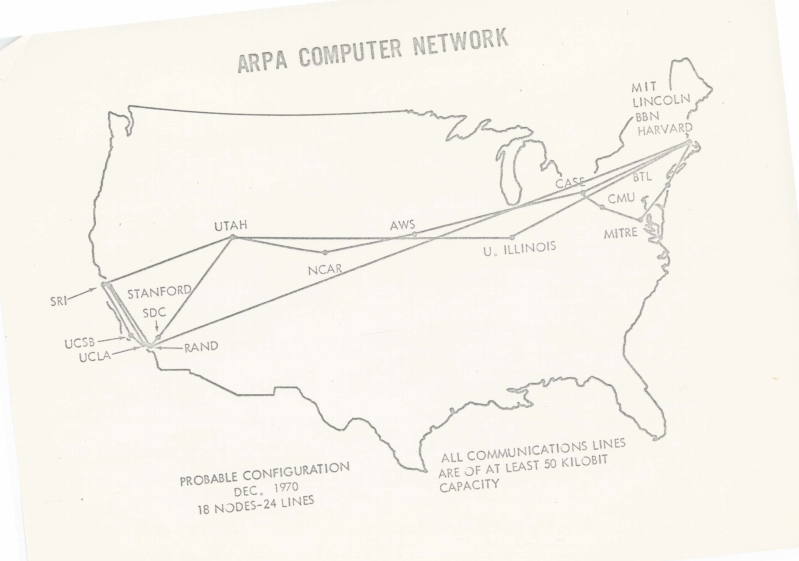 It was this renewed vigor that gave rise to the first wide-area network, called the ARPANET, which delivered its first message in 1969. 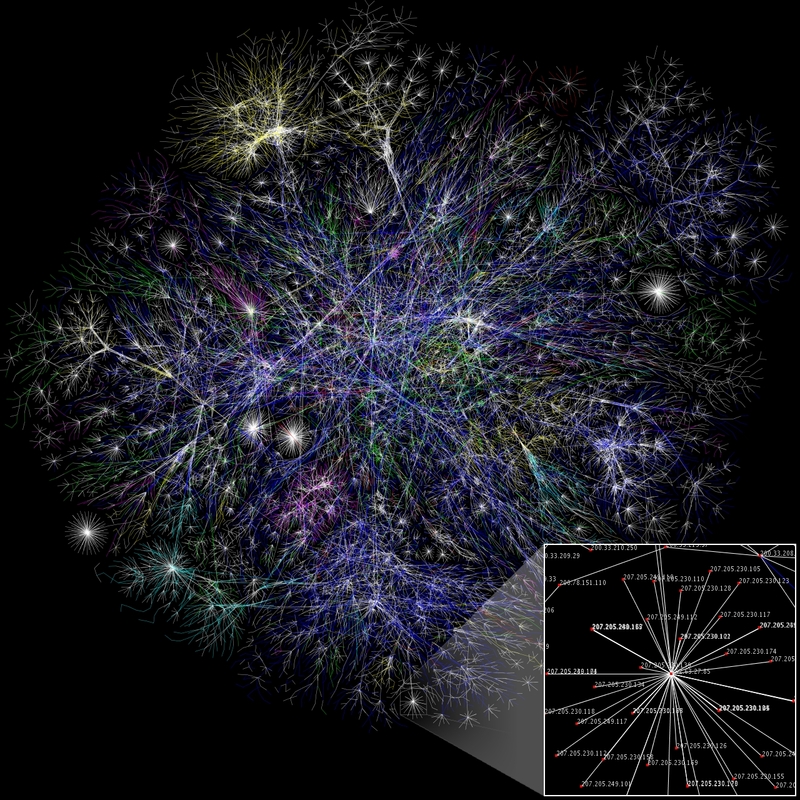 Throughout the following two decades, this initial network grew into thousands of similar connections between various points all around the globe. In 1991, however, things changed forever once again. That year, a Swiss computer programmer named Tim Berners-Lee  introduced the masses to the concept of a World Wide Web; a system of interconnected information hubs that any user could freely navigate to and interact with. Far from the simple peer-to-peer file sending capabilities of ARPAnet, Berners-Lee laid the groundwork for the all-consuming Internet we know today. …For reference, that’s less than half the average speeds for countries like Norway, Hungary, and the Netherlands. 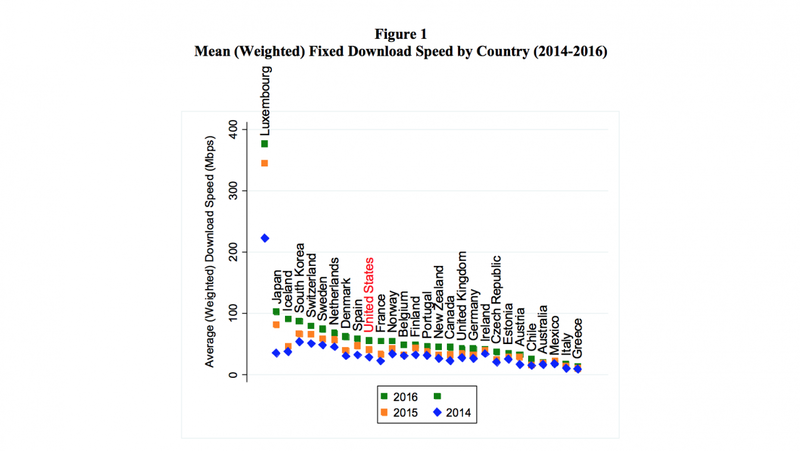 In addition to having slower speeds than many other countries, Americans also pay more per megabit as well. 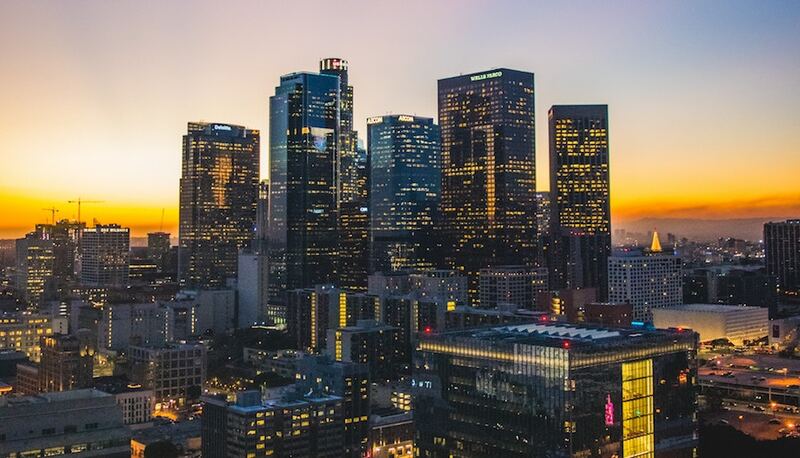 For instance, new data  shows that a 500 Mbps connection in Los Angeles runs users an average of $299 dollars per month, whereas a 1000 Mbps down speed can be had in cities like Paris, France for a mere $35 and some change. America, meanwhile, placed 14th on the list, behind countries like Belgium, Romania, and the Czech Republic. 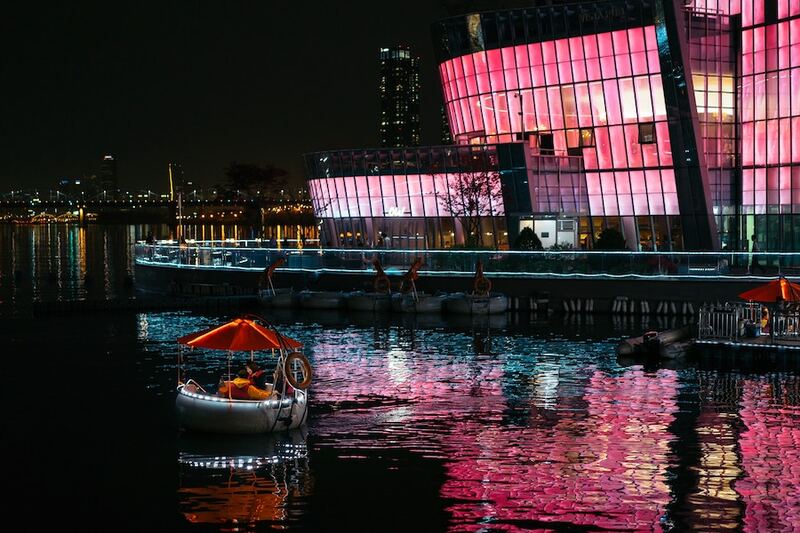 South Korea’s success in this regard isn’t entirely a fair comparison to make, as the country is both much smaller and much more densely populated than the US, allowing for shorter lines to be run, reducing costs significantly in the process. 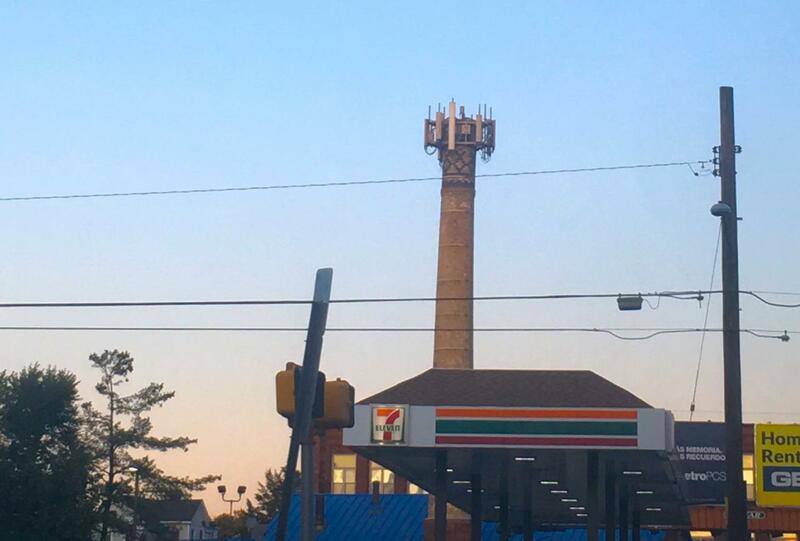 All the same, the country serves as a stark reminder of what is possible with a concentrated effort centered around ensuring that all of its citizens have stable, fast connections to the Internet. In terms of consumer choice, things are much rosier in the lower half of the Korean peninsula as well. Though there are still only three major providers in South Korea at the moment (KT Corp, SKBroadband, and LGU+), numerous smaller options exist that keep the country in a constant state of healthy competition, making consumers the clear winner at the end of the day. How wide, you say? Recent numbers show that as many as 50 million US households only have access to one service provider offering at least 25 Mbps download speeds – or none at all. For how much time Americans spend on their devices, we certainly don’t seem to have many options when it comes to how we get connected, or how much we pay for the ability to do so. So, why is it that the world’s largest (and most-developed) economy has landed in such a poor position when it comes to giving users attractive options for their Internet service? The shortest answer: money. The slightly longer explanation: our last mile network infrastructure is severely lacking, and there’s very little incentive for those in power to do anything about it. Understanding how your devices communicate with the wider Internet is crucial to truly grasping America’s current connectivity problem, but it’s easier to comprehend than you might expect. There are three critical “tiers” that provide the structure we use to connect to the Internet, and in order to understand why download and upload speeds are so poor in the US relative to other countries, you need to have at least a basic grasp on each of them. The third tier is commonly described as the “last mile” for your connection, and it’s also the easiest to understand for most. Controlled by just a few players (Primarily Charter, Comcast, AT&T, and Verizon), this section involves the physical wires that run from your home or apartment to a nearby hub. 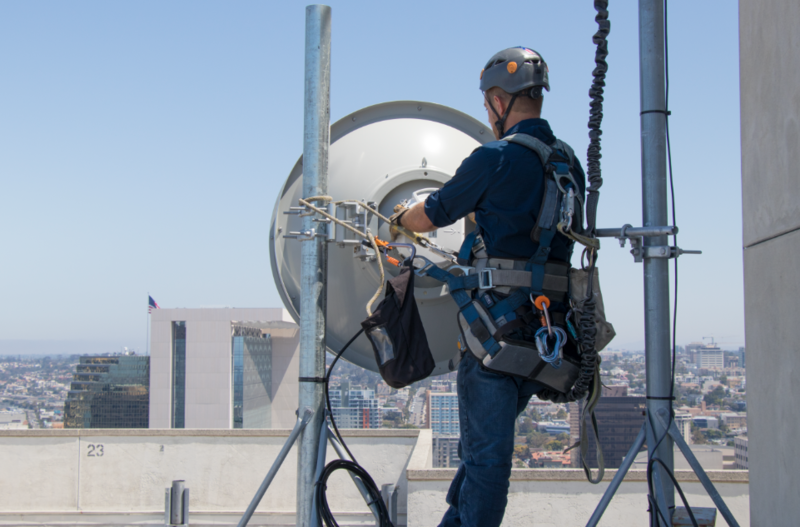 These hubs equate to central groups of routing equipment that dot the landscape in cities across America, with cables underground and above on poles that collect and organize individual connections into digital data (ones and zeros). From here, your data is pooled together with those of others in your area, expanding into the second tier, where things get a bit more complex. That’s because this wider structure of the web in America is owned by many different companies, all of which have to get along in order to provide users with uninterrupted speeds. The main idea is that tier two providers are incentivised to “peer” with larger tier one providers like Cogent, Level 3 and AT&T in order to gain access to all of the various routes connected to the wider Internet. These peering connections happen at “Internet exchanges” distributed across the globe. Now imagine that all of the middle-men owners of these connection points got along perfectly with one another. Data could move freely around the world, and we’d all live in some sort of blissful ultra-connected utopia (okay, maybe it wouldn’t be that blissful, but still). 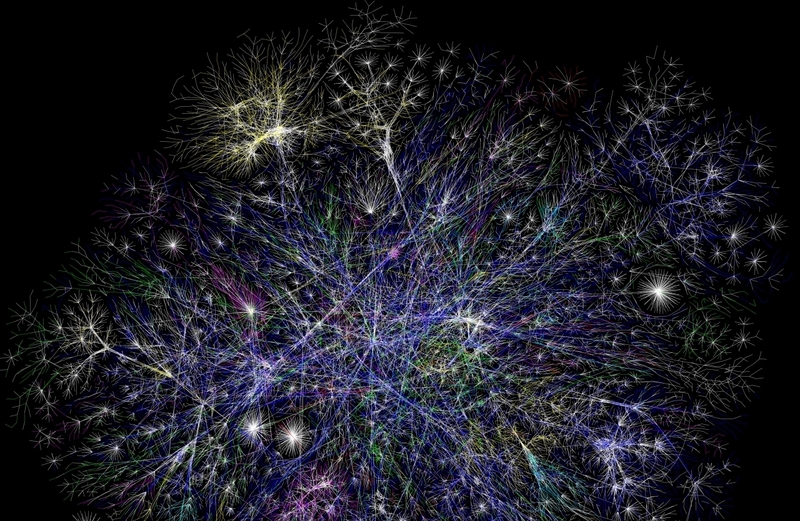 The last (and largest) portion is commonly referred to as the “backbone” of the Internet. 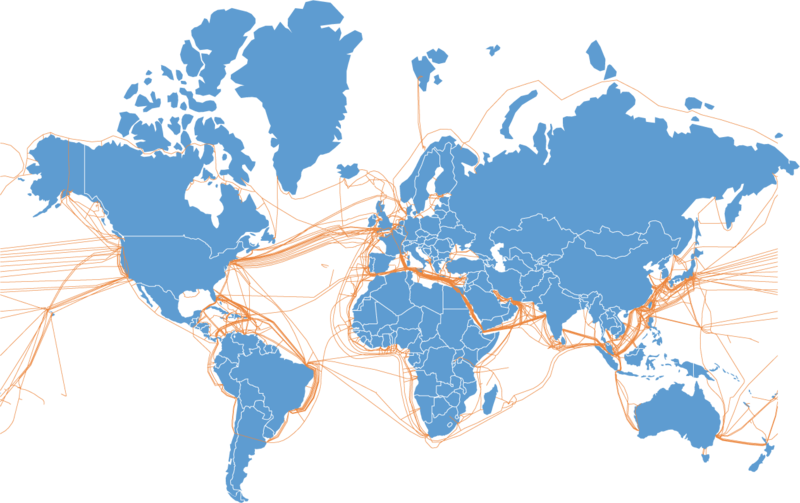 This is the globe-spanning network of cables  you might have imagined when thinking to yourself about how you communicate with users all over the surface of the planet. For the most part, this section is also controlled by heavy hitters such as Verizon and AT&T, amongst several other companies who you’ve probably never heard of. Unsurprisingly, the largest performance slowdown happens at the last mile, which acts as a bottleneck for the rest of the wider network. The few companies that own this infrastructure often operate without robust competition, which leaves the pricing power on a key communication tool at the mercy of a handful of companies who — as is normal for companies in a free market economy — have to put their shareholders first. This is a prime example of how being the first mover on a preeminent technology isn’t always an advantage in the long-run. The very things that make America a strong force for change in the world (a spirit of innovation and a free and open market) are actually holding us back in this regard, and the “if it ain’t broke, don’t fix it” mentality approach to rural networks certainly isn’t helping. 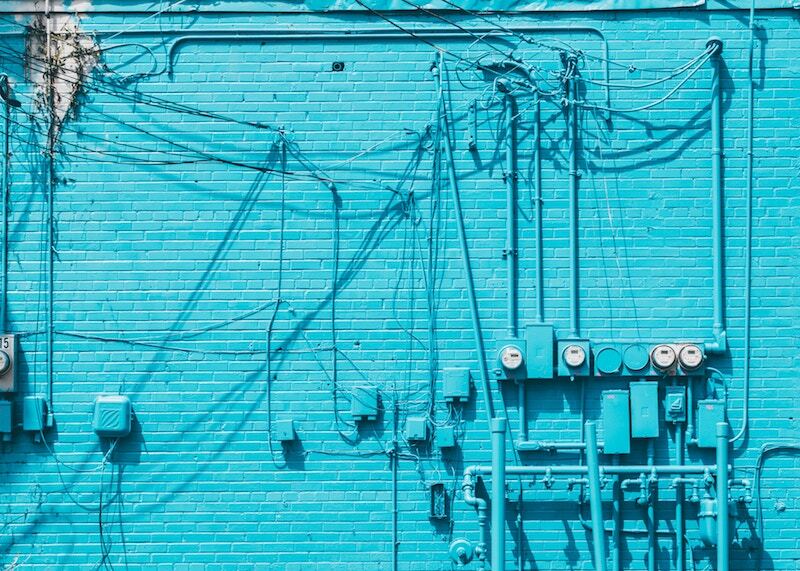 Simply put, it’s no surprise that ISPs don’t act like nonprofits or utility companies when it comes to improving their customer’s connectivity. In a world where being connected is increasingly considered an integral aspect of being a productive member of society, that obviously creates a serious problem when large swathes of the population struggle to pay for speeds that are overall slower than other developed nations. This is where the great net neutrality debate comes into play. WIth the FCC entangled in a complex web of interests, it’s up to those in Congress and in business alike to be proactive, thinking up and engineering solutions that will pave the way for future growth. Until major service providers are given sufficient reason to augment and improve their aging infrastructure in America, nothing will happen. Whether this change is spurred on by clever technological innovations or more government intervention still remains to be seen, but it’s increasingly likely that we’ll need a bit of both in order to get the job done. 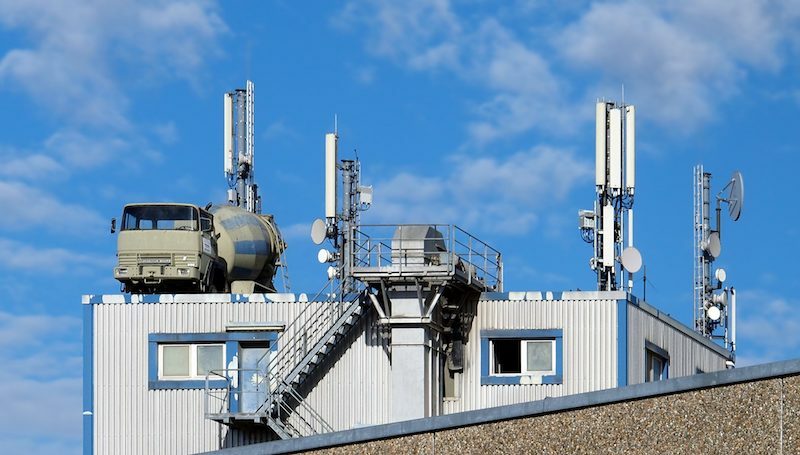 In the first example above, a company called Monkeybrains is beginning to offer direct, high-speed Internet access to users by utilizing quickly-evolving fixed wireless technology. By doing so, they are effectively bypassing a stretch of wires in the last mile and allowing users to pay rates as low as $35 per month (after a $250 initial installation fee) for connection speeds that rival those offered by traditional coaxial and fiber cables. 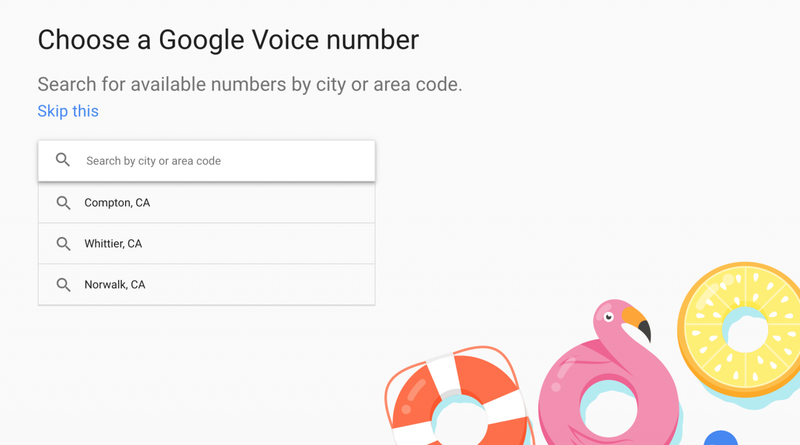 It isn’t just smaller entities getting in on this, however; Google has been slowly pivoting towards their fixed wireless offerings since acquiring Webpass in 2016. Of course, this only applies to those who live in cities where these companies are already operating, for the moment at least. A true networking revolution will require this kind of innovative thinking on a nationwide scale, which is something that we’ve still yet to see. More recently, the tech giant announced that their smart-city spinoff, Sidewalk Labs, has penned a deal with the city of Toronto to turn 800 acres of land bordering Lake Ontario into an “Internet city.” Projects like this may be a tremendous boon to future city planning with robust consumer networks in mind, allowing for even greater innovation on a municipal level. So, where do we go from here? We understand the problem, and why it’s so difficult to get around, and we also know what needs to happen in order to truly bring on the change we so desperately need. Ultimately, America’s Internet problem doesn’t have one swift, all-encompassing fix. The only path forward relies upon improved and modernized regulations, and meaningful competition amongst the heavy hitters. In closing, here are some further reading resources on some of the specific proposed solutions currently popular with pro-competition broadband advocates. Municipal bonds: A municipal bond system that would attempt to make the 30-year payoff for local fiber infrastructures much more reasonable. Shared wiring requirements: A system for sharing wiring in the last mile, allowing more small companies to compete on customer service and incentivizing competition to areas that historically have had none. The post Why Is the American Internet Empire Crumbling? appeared first on Broadband Now.